Uncovering of the Relics of the Monk Seraphim, Wonderworker of Sarov: At the beginning of the last century (i.e. the 1800's) a new bright taper blazed upon the candle-tiara of the Russian Orthodox Church. The Lord deigned to send to us on earth a great man of prayer, an ascetic and wonderworker. In 1903 occurred the glorification of the Monk Seraphim of Sarov, 70 years after his repose (the Vita (Life) of the saint is located under 2 January, the day of his repose). On 19 July, the birthday of the saint, his relics were opened with great solemnity and placed in a prepared reliquary. The long awaited event was accompanied by numerous miraculous healings of the sick, who in large number had gathered at Sarov. 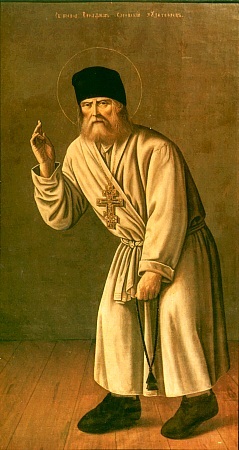 Very widely esteemed while yet alive, the Monk Seraphim became one of the most beloved saints of the Russian Orthodox nation, indeed like the Monk Sergei of Radonezh. The spiritual path of the Monk Seraphim was marked by great modesty, inherent to the Russian saint. From childhood having been chosen by God, the Sarovsk ascetic without hesitation or misgiving ascended from strength to strength in his striving for spiritual perfection. Eight years of novitiate tasks and eight years of temple service in the dignity of deacon and priestmonk, wilderness-dwelling and pillar-dwelling, hermitage and solitude followed upon each other and crown his eldership. His deeds, by far exceeding natural human abilities (for example, the prayer upon the stone for a thousand days and nights), harmoniously and readily enter into the life of the saint. The mystery of a living and prayerful communality defines the spiritual legacy of the Monk Seraphim, but he left to the Church still another precious thing – a short but fine directive, written in part by himself, and in parts by those listening to him. Shortly before the glorification of the saint there was found and printed in 1903 his "Conversation of the Monk Seraphim of Sarov, Concerning the Goal of Christian Life", compiled at the end of November 1831, roughly a year before his repose. This conversation was a very precious contribution of the ascetic into the treasury of teachings of Russian holy-fathers. Besides his teaching about the essence of Christian life, in it are contained new explanations of many important places of Holy Scripture. "Fasting, prayer, vigil and every good deed, – taught the Monk Seraphim, – being howso no less fine in themselves, yet however in fact the goal of our Christian life does not consist only but in them, though they serve as means for its attainment. The true goal of our Christian life is the acquisition of the Holy Spirit of God". Once however situated in the Spirit of God, the monk glimpsed all the Russian land, and it was filled and as it were covered over by the incense-cloud of the prayers of the faithful, rising up in supplication to the Lord. In the recorded life and deeds of Saint Seraphim are quoted many eye-witness accounts of the graced gift of perspicacity (i.e. insight), which he utilised for stimulating within people repentance of sins and moral rectification. "The Lord hath revealed to me, – said he, – that there shalt be a time, when the hierarchs of the Russian land and other spiritual persons will deviate from the preservation of Orthodoxy in all its purity, and for this the wrath of God wilt strike them. For three days I stood, I besought the Lord to have mercy on them and besought it better to deprive me, the wretch Seraphim, of the Kingdom of Heaven, than to punish them. But the Lord inclined not to the plea of the wretch Seraphim and said, that there would be not mercy for them, since they will teach human teachings and commandments, while their hearts stand far from Me". Manifesting the graced gifts and power of God to people, the Monk Seraphim instructed those coming to him, on how to transverse the narrow path of salvation. He commanded obedience of his spiritual children and to the end of his life he was faithful to it. Having spent all his life in ascetic deeds beyond the power of ordinary people, his advice was to go by "the royal (middle) way" of the holy-fathers and not take upon oneself excessive difficult works: "to take on excessive measure of exploit is not necessary; but strive, so that the other aspect – our flesh – be true and capable for the doing of good deeds". The monk considered prayer to be the prime exploit and means for the acquisition of the Holy Spirit. "Every good deed, done on account of Christ, bestows the grace of the Holy Spirit, but... prayer most of all beareth the Holy Spirit, and it is most convenient of all for each to improve". The Monk Seraphim advised during the time of Divine-services to stand in temple now with eyes closed, and then to turn one's gaze upon an image or burning candle and ponder this thought, – that it would suggest the fine comparison of human life with a waxen candle. If someone complained to the holy elder about the impossibility to fulfill the rule of prayer, he then advised them to pray unceasingly: both during the time of work, and when going wherever, and even in bed. And if anyone can make the time, said the monk, let them take on soul-edifying prayers and readings of prayer-canons, akathists, psalms, the Gospel and Epistles. The saint also advised to study the order of Divine-services and to commit them to memory. The Monk Seraphim regarded a lengthy rule of prayer as non-obligatory and he gave his Diveevsk community of women monastics a light rule. The Mother of God forbade Father seraphim to obligate novices with the reading of long akathists, so as not to impose an excessive burden on the incapable. But with this the saint strictly mentioned, that prayer ought not to be a formality: "Those monks, who do not unite external prayer with the inner, are not monks, but black torch-heads!" There thus became known the Seraphim Rule for those laypeople, who under the circumstances of life were not able to read the customary morning and evening prayers – in the morning, before lunch and at evening to read the "Our Father", thrice the "Hail Mary, Virgin Mother of God", the Creed "I Believe" once; attending to necessary tasks, from morning til dinner to do the Jesus Prayer "Lord, Jesus Christ Son of God, have mercy on me a sinner" or but simply "Lord, have mercy", and from dinner til evening the prayer "MostHoly Mother of God, save me a sinner" or "Lord, Jesus Christ, through the Mother of God have mercy on me a sinner". "In prayers be attentive to thyself, – advised the ascetic, – that is, prepare the mind and unite it with the soul. On the first day, twice or more make this prayer with the whole mind, attending separately to each particular word. Later on, when the Lord heats thy heart with His warm grace and unites that in thee in one spirit: then flows within thee unceasingly that prayer and always will it be with thee, delighting and nourishing thee..." The monk said that in fulfilling this rule with humility, it is possible to attain Christian perfection even in worldly life. "One mustneeds provide the soul with the Word of God. Most of all one ought to exercise in the reading of the New Testament and the Psalter. From this occurs enlightenment of the intellect, which is transformed by a Divine transformation", – advised the holy ascetic of Sarov, himself constantly reading through all the New Testament during the course of the week. Communing the Holy Mysteries each Sunday and each feastday without fail, – to the question of how often one should approach for Communion, the Monk Seraphim answered: "the more often, the better". He said to the priest of the Diveevsk community, Vasilii Sadovsky: "The Grace, given us by Communion, is so great, that though a man be unworthy and sinful, if such a man in humility conscious of his all-sinfulness approacheth nigh [for Communion] to the Lord, Who hath redeemed us all, though he be covered head to foot by the bounds of sin, yet shalt he be cleansed by the grace of Christ, for all the more and more it illumineth him, and altogether it doth enlighten and save him". "I believe, that through the great blessing of God grace doth make its mark also upon those communing..." The saint however did not give everyone the identical advice regarding frequent Communion. For many he advised to make the preparatory fast during all four lenten periods and during all the twelve feastdays. But it is necessary to remember his warning about the possibility of communing unto condemnation: "Sometimes thus it doth happen: here on earth they indeed do commune, but with the Lord they remain non‑communicants!" "There is no worse a sin and nothing is more terrible and harmful of spirit than despondency", – said Saint Seraphim. He himself shone with a spiritual joy, and with this quiet peaceful joy he in abundance filled the hearts of those about him, greeting them with the words: "My joy! Christ is Risen!" Every burden of life became light while being close to the ascetic, and a multitude of the grieving people and seekers of God crowded about his cell and together with them hermits, wanting to share in the graces radiating from the God-pleasing saint. In the eyes of all was affirmed the truth, expressed by the saint himself in a great angelic calling-out: "Acquire peace, and around thee a thousand wilt be saved". This command about the acquisition of peace leads up to the teaching about the acquisition of the Holy Spirit, but of itself it appears as a most important step on the way of spiritual growth. The Monk Seraphim, in experience having passed through all the ancient Orthodox science of ascetic deed, foresaw how the spiritual activity of coming generations would be, and he taught to seek out peace of soul and to condemn no one: "Whoso goeth about in a worldly manner, that one as though a liar draweth up spiritual gifts". "For preserving peace of soul... everyone ought to flee the judging of others... In order to be delivered from judgement, one ought to attend to oneself, and not from whomever to adopt extraneous ideas and become deadened towards everything". The Monk Seraphim rightly can be called a disciple of the Mother of God. The MostHoly Mother of God thrice healed him from grievous illness, and repeatedly She appeared to him, guiding and encouraging him. While still at the beginning of his way he heard, how the Mother of God in directing him as he lay upon his sick bed, said to the Apostle John the Theologian: "This one is of our kind". Upon emerging from seclusion the monk devoted much effort to the building up of the women's monastic community at Diveevo and he himself said, that he gave no particular directives on his own, but rather he gave everything through the will of the Queen of Heaven. The Monk Seraphim stands at the head of a remarkable upwards-flight of Russian Orthodox spirituality. With great strength resounds his recollection: "The Lord seeketh out the heart, overflowing with love towards God and neighbour; here is the throne, upon which He doth love to preside and appear in the fullness of His supra-heavenly Glory. "Son, give Me thine heart, – sayeth He, – and all else I Myself wilt provide thee", – wherefore it is in the human heart that the Kingdom of Heaven can be realised".